How People Lived takes readers on a journey not only from prehistory to the present (and beyond), but also moves the scene around the globe. The itinerary follows the early migration route of humans, takes in the wonders of the Mayans, Ancient Egypt, and Rome, visits a thronging festival in 12th-century China, witnesses the colonists settling in America, and joins a crowded street market in Delhi. There are but a few highlights of the tour, which comes right up to the technology-driven 24-hour lifestyles of inhabitants of a sophisticated modern city. Stunning, full-spread, densely packed artworks are filled with accurate observations, historic details, and witty cameos for the sharp-eyed viewer to spot. 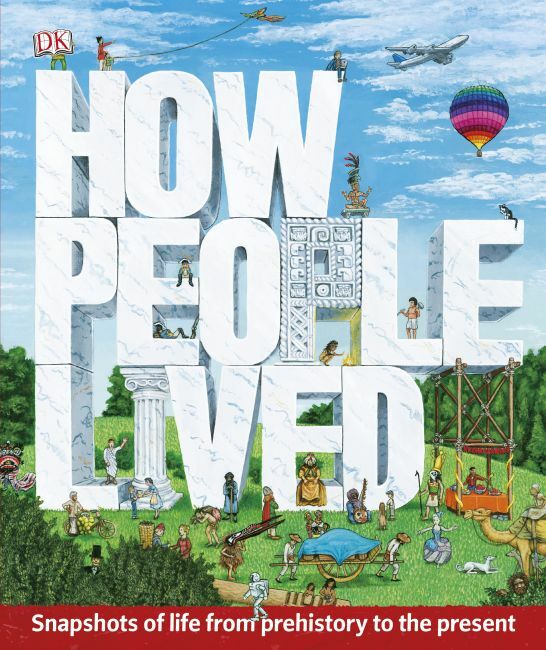 While fascinated readers pore over the pictures, several levels of text provide information about the period in history illustrated-the people, their lifestyles, and their social and technological developments. Follow-on spreads reveal artifacts, fossils, and evidence, highlighting building techniques, inventions, and landmark lifestyle changes as they arise and provide comparisons with contemporary civilizations around the world.